Home Unlabelled Air Tanzania resumes flights to Mtwara this Friday,8th Feb 2013. 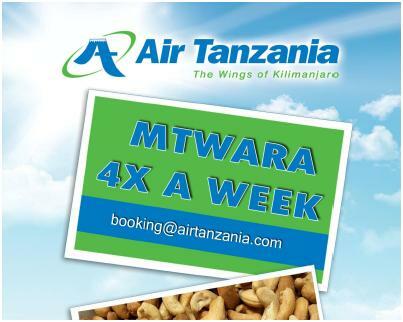 Air Tanzania resumes flights to Mtwara this Friday,8th Feb 2013. 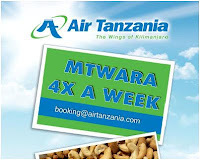 AIR Tanzania Company Limited (ATCL) is set to resume its Dar es Salaam (DAR) - Mtwara (MYW) flights on Friday, 8th Feb 2013. According to ATCL's Chief Executive Officer, Captain Milton Lazaro, the "Wings of Kilimanjaro" will be flying to Mtwara four times a week using its 50-seater Bombardier Dash 8-300 equipment. ATCL will initially fly to Mtwara on Mondays, Wednesdays, Fridays and Sundays, with plans for adjustments according to the demand. The resumption of the Dar - Mtwara flights is part of ATCL's promise of aggressive expansion drive which will see the airline extending its wings to destinations not covered at the moment.